Well, I’ve done something new, actually a few new things. Lina over at Lin’s Recipes created a food challenge for the month of January, a “Rare Recipe Challenge.” Lina did her homework and found dishes from around the world that may be new to you and me. People were invited to pick one of the dishes to research, find recipes for, and create. The hook- you had to choose something you had never eaten or made before. Clearly, I was still riding the sugar and cocktail fueled high of the holidays because I quickly agreed to not only my first “challenge,” but also to making something I had never eaten, heard of, or had a recipe for. Oh and let’s not forget, by participating I agreed to post all about it! Yikes!!! I chose to make Shish Taouk (pronounced “shish tawook”), a Middle Eastern type of fast food. Here’s a bit of trivia: did you know that ‘shish’ means skewer and ‘taouk’ means chicken in Turkish? These marinated chicken kebabs are found throughout Middle East; though each country has its own twist on the marinade. And that is the biggest challenge… not only does each country have its own version, but each cook within each country has their own version. It would be like doing a Google search among Italian grandmothers, with the inquiry “meatball recipe.” The number of results would equal the number of grandmothers, and each recipe would be slightly different. There would be no ONE meatball recipe. Well, it’s the same with Shish Taouk. There are thousands of recipes out there, and I read a lot of them. Some use yogurt, some don’t; some use tomato paste, some ketchup, and I found a few that use both; the spices were all over place- mint, thyme, cumin, paprika, oregano, cayenne. Lemon juice and bunches of garlic were a constant, though even there the amounts varied. For example, one recipe called for 1 cup of lemon juice, while another (using the same amount of chicken) used only ¼ cup. Cooking methods ran the gamut from grilled on a barbeque to pan fried to broiled. I would have preferred to grill, but because of weather, I broiled my chicken kebabs and the veggie kebabs I made to serve alongside the meat. After loads of research I came up with my recipe for Shish Taouk; full disclosure here, since I’ve never tasted an authentic Shish Taouk I have no idea if my method is a proper interpretation or not. That said, the night I was making this for dinner my oldest walked into the house after basketball practice and announced, “It smells good in here, like a Middle Eastern restaurant!” Ahhh, the sweet smell of success (or shish taouk!). The yogurt tenderized the chicken; the lemon juice added just enough tang to balance out the pungency of the garlic. The spices I chose worked well- cumin brought just the right amount of heat and the smoked paprika added a lovely smokiness that was especially welcome since the kebabs were cooked under a broiler, not grilled outside over a fire. The tomato paste and smoked paprika turned the entire mixture an orange-pink which provided a beautiful color to the finished dish. The entire family loved it and I’ll definitely be making it again. 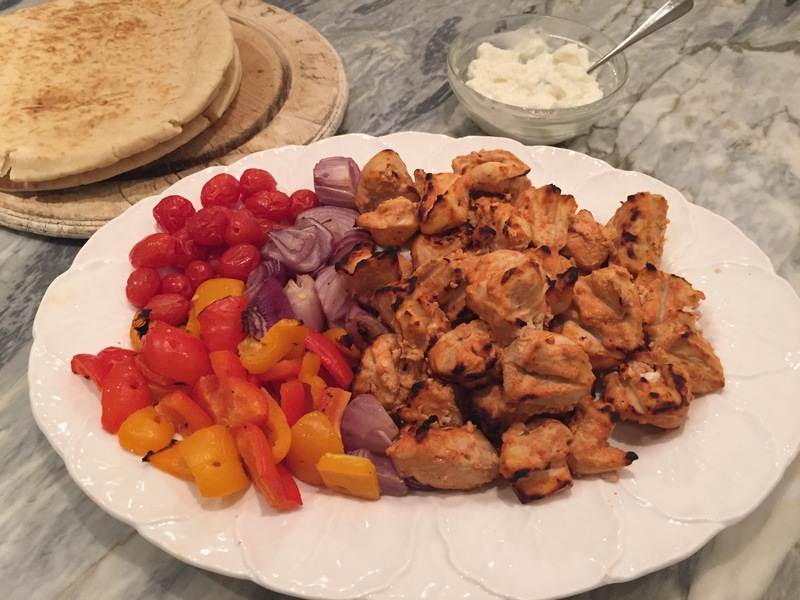 I served the chicken with broiled skewers of bell peppers, red onions, grape tomatoes and warm pita bread. In Lebanon they traditionally serve Shish Taouk with toum, a garlicky lemony mayonnaise. Oh my, it is good and will be used in my house for more than just these kebabs. Tzatziki would also be delicious- not traditional, but it seems everyone has their own version of this dish, so why not? Well, I’m off to the Rare Recipe Challenge and bringing my Shish Taouk. Thank you to Lina for creating this fun challenge, and thank you to Jhuls from thenotsocreativecook.wordpress.com for judging the entries. I loved getting outside my culinary comfort zone, researching this delicious dish, and devouring the results. New year, new foods, new challenges! Combine yogurt, juice of 2 lemons, extra virgin olive oil, garlic, tomato paste, cumin, smoked paprika, and salt and pepper in a large bowl. Mix well. 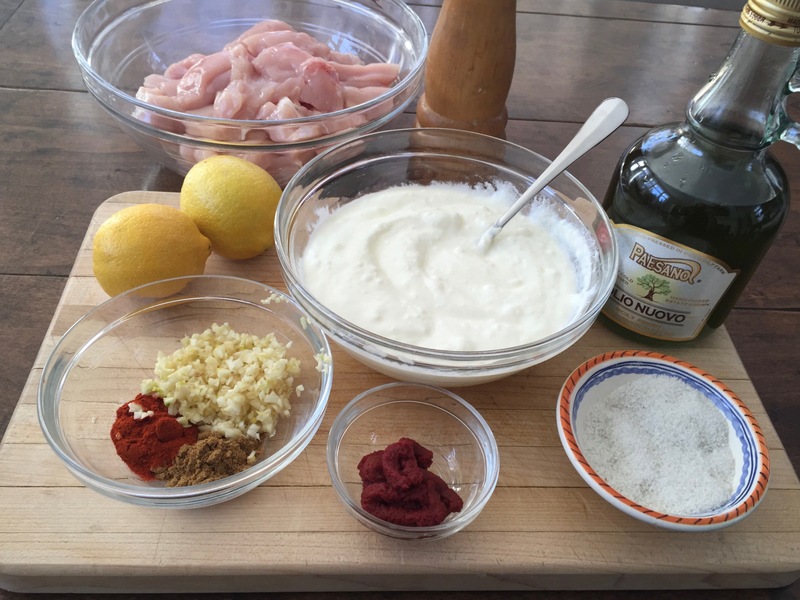 Add chicken pieces to yogurt marinade and stir. Be sure that all the chicken pieces are coated in the yogurt mixture. Cover and refrigerate for at least 2 hours and up to 8 hours. While chicken is marinating make the toum (garlic mayonnaise). In a food processor place garlic, lemon juice and generous pinch of salt. Process to chop up garlic. You will have to stop and scrape sides of processor several times while chopping the garlic. With processor running, slowly drizzle in the egg white. As the processor continues to run, slowly add the canola oil in a steady stream. You should have a mayonnaise at this point. Thin out slightly by adding 1-2 Tablespoons of ice water while the machine is running. Transfer mayo to airtight container and refrigerate. When you are ready to make the kebabs, preheat your broiler or grill. 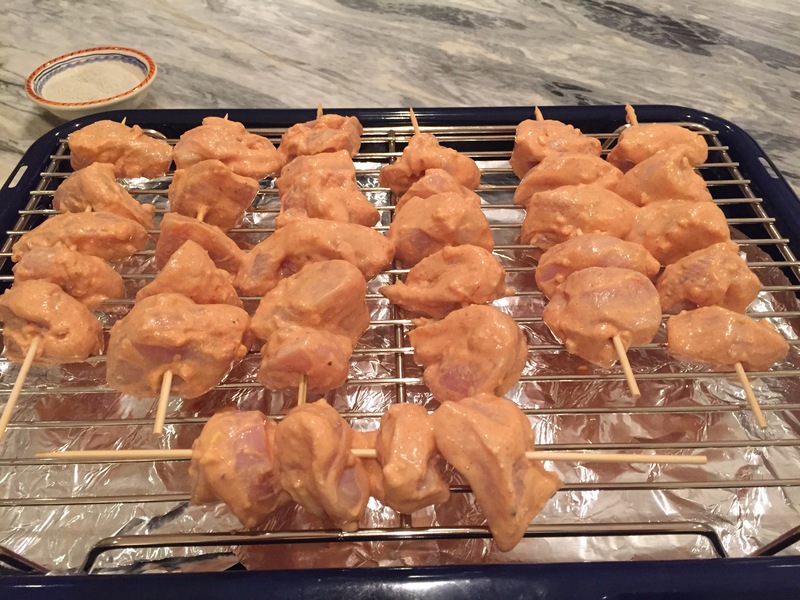 Thread 5-6 pieces of chicken on each skewer (It will be gloopy, but don’t worry. There is no need to scrape yogurt mixture off the chicken pieces). Broil or grill chicken until done, about 15 minutes, turning over once at the halfway mark. Serve immediately with pita, toum, and grilled veggies. Gather your ingredients: cubed chicken breast, plain yogurt, lemon juice, olive oil, garlic, smoked paprika, cumin, tomato paste, salt and pepper. Combine all the ingredients, except the chicken, to create the marinade. Stir well to combine marinade ingredients. Add chicken pieces to yogurt marinade, stirring well to coat. Cover and refrigerate at least 2 hours, and up to 8 hours. While chicken is marinating, make the toum. Chop garlic with lemon juice and generous pinch of salt. While processor is running, slowly drizzle in egg white. With processor still running, drizzle oil in a slow steady stream. 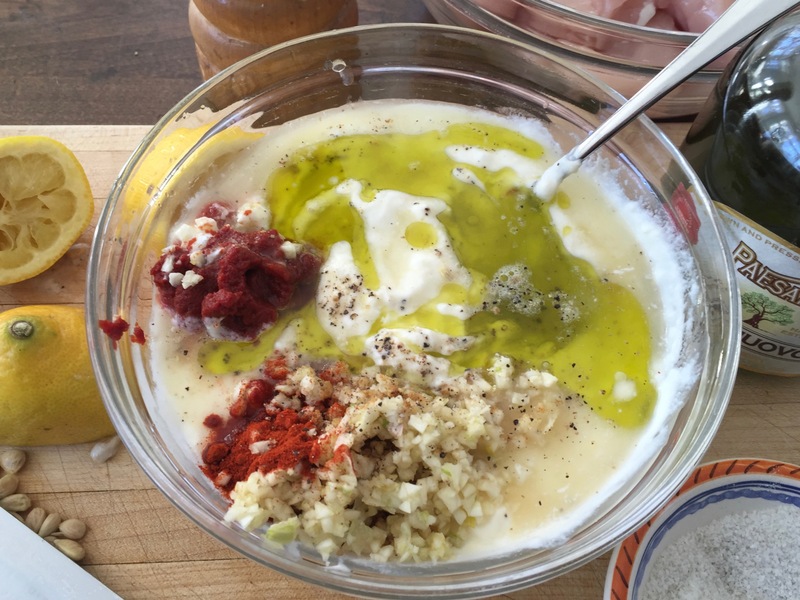 The mixture will emulsify and come together as a mayonnaise. Add 1-2 Tablespoons of ice water to thin out. This delicious garlicky, lemony mayo will find all sorts of use in your kitchen! Grill or broil the kebabs- depending on your grill or oven, approximately 7 minutes per side. My broiler pan was set about 6 inches under the heating element; my kebabs took about 7 minutes per side. Serve with grilled veggies, toum, and pita bread. Shish Taouk with grilled veggies and toum on pita bread. Oh. My. God. This looks just incredible! Well done!!!!!! Jean, excellent! Glad you also enjoyed the purging of the dish!!! I write, create and tweak so many recipes Jean I am in the thousands. My large young family loves choices and my mission daily is to provide them with balanced meals! Sometimes, most home cooks get bored or in a rut in the cooking arena! Not me I love foods too much. Glad the family enjoyed your choice! Yay. LOL or just plain crazyyyyyyyyyyy! Thank you very much for the kind words, Sarah! 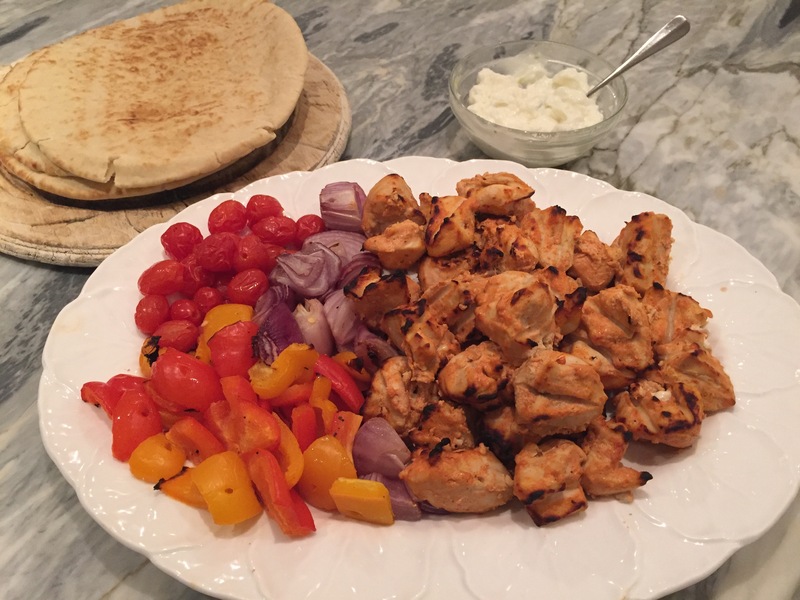 The kebabs were a hit at my house… I hope you can give them a go sometime! One of my favorite dishes! Awesome job and looks so tasty! Yes it is funny if you haven’t tasted the dish it is hard, I know that first hand with all of my experiments years ago! but this looks yummy! Looks delicious! My family loves Shwarma and I think they will really like this too! Thanks! I’ve never had Shwarma- can you believe it? I’ve read so much about it and heard it’s amazing. Do you have a favorite recipe? Honestly we usually eat out for Shwarma. There is a Shwarma King near my daughter’s dance studio but I did make a Shwarma burger that was amazing. Posted it on my blog just a week or two ago. Thank you so much for the very kind feedback! 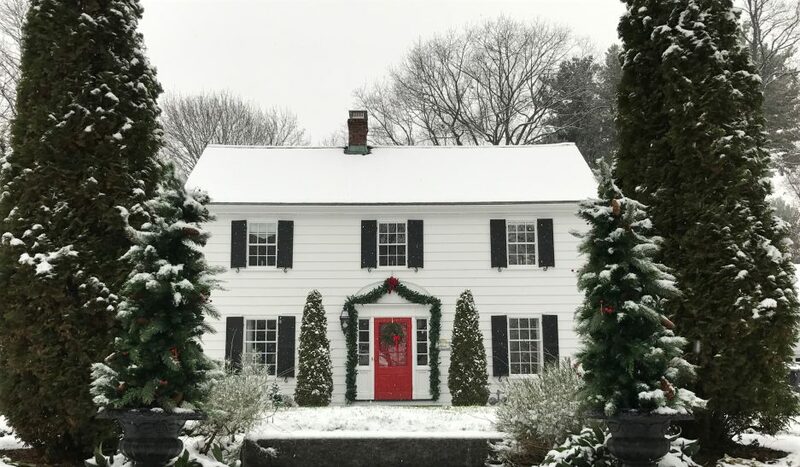 I really enjoyed taking part in this challenge- though I was a bit nervous because I’ve never participated in any sort of blog related group activity. Thanks for encouraging me to get out of my comfort zone, I’m looking forward to more of your challenges! Thanks for organizing. I would say your first attempt at this recipe is a resounding success based on the feedback from your family! It looks absolutely delicious. Great job! They look so good!!! You did a fabulous job on the recipe! Thank you so much, Freda! I love everything about here – the introduction, your experience in making this and your chosen recipe. I have tried making shish taouk before and it was really good. I cannot remember if I have tried authentic one before, but I loved my version more than the take-away ones. As the saying “Homemade is always the best.” I love that you made your own garlic sauce as well, I always cheat and buy a ready made one. 😀 Thank you for sharing this delicious recipe and for sharing your adventure with the first Rare Challenge. Absolutely gorgeous looking. You can’t go wrong with chicken on a skewer and when you add a Pitta bread, well you have my attention. I adore this type of food and even more so since my operation so thank you for finding it out, it will definitely feature in my diet over the coming weeks….. Thank you, WBFM! You’re right… it’s hard to go wrong with chicken kebabs wrapped in warm pita! I’m so glad this works well in your post-op food plan. Let me know if you give it a try; I’d love to hear how it went. These looks like amazing kabobs- turned stuffed pitas! Yum! I’m so happy you stopped by, CH! 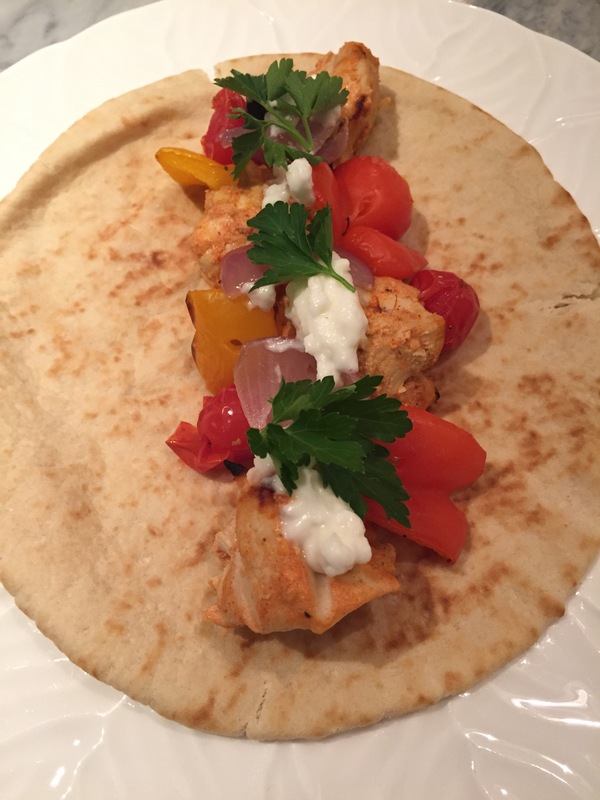 The recipe challenge was fun; I loved doing the research and making the shish taouk. Now, the fun continues because we get to visit and see what the others made. Love it! This looks awesomely good! The sauce seems unique, makes it differ from shish kebabs. I want to try it. Thanks so much! The sauce was new to me as well, but very easy to make… and very very garlicky and lemony (which I loved!). This dish looks very flavorful and versitale! 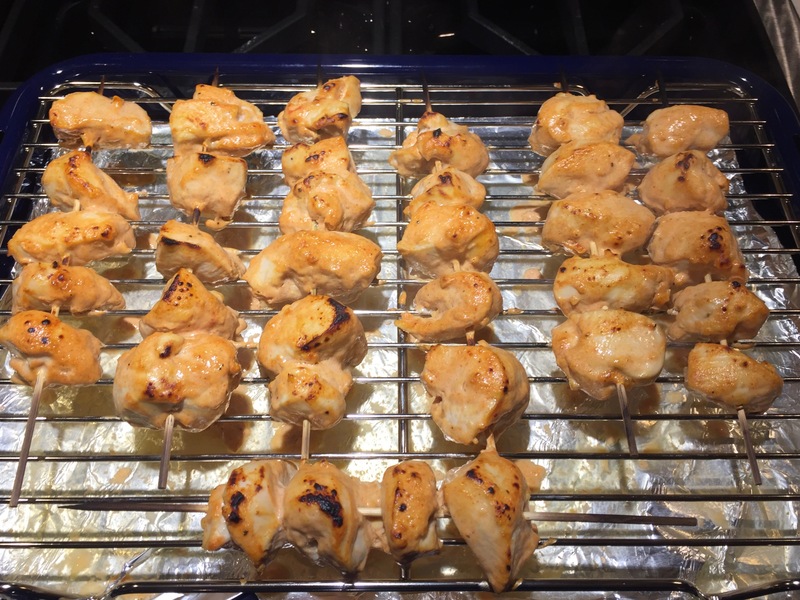 Pingback: Shish Taouk – What's for Dinner Moms? OMG..Amazed by your research.. Kudos. Great recipe..
Having lived and travelled in many Middle Eastern countries and eaten loads of shish taouk, I think I can honestly say your recipe is spot-on in my book! Now I need to try it. Thanks to you for doing all the hard work to figure it out. Thank you so much! I really appreciate you stopping by and commenting!